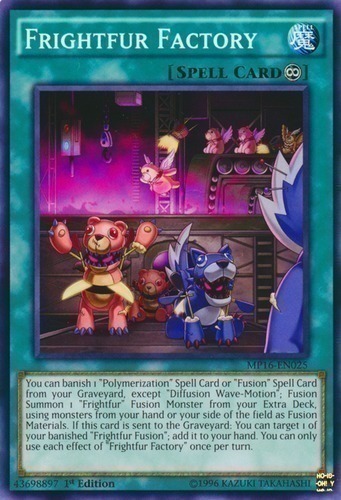 You can banish 1 "Polymerization" Spell Card or "Fusion" Spell Card from your Graveyard, except "Diffusion Wave-Motion"; Fusion Summon 1 "Frightfur" Fusion Monster from your Extra Deck, using monsters from your hand or your side of the field as Fusion Materials. If this card is sent to the Graveyard: You can target 1 of your banished "Frightfur Fusion"; add it to your hand. You can only use each effect of "Frightfur Factory" once per turn.